Yesterday, we posted an announcement that we were expecting to be hit by Hurricane Irene. Well she came, we saw, and have all lived to tell the tale. Honestly, neither of our parties really had much damage to speak of, just a few twiggy tree limbs and leaves here or there in our yards. Another of our cousins, Michelle, from Poo-Pies.com, who lives closer to Jesse and Taylor than I, though still not far, did lose power and, I believe, may still may be without power, but that, thankfully, is the worst any of our family experienced with this storm. In order to break a tie, we need to do a second poll to determine which book will be our second September read. This poll is limited to the four books that were voted for and tied, but didn't win. This poll will only run through the 31st, only 3 days, so be sure to cast your votes! *Description* When fifteen-year-old Clary Fray heads out to the Pandemonium Club in New York City, she hardly expects to witness a murder - much less a murder committed by three teenagers covered with strange tattoos and brandishing bizarre weapons. Then the body disappears into thin air. It's hard to call the police when the murderers are invisible to everyone else and when there is nothing - not even a smear of blood - to show that a boy has died. Or was he a boy? *Description* I had a life anyone would kill for. *Description* St. Vladimir’s Academy isn’t just any boarding school—it’s a hidden place where vampires are educated in the ways of magic and half-human teens train to protect them. 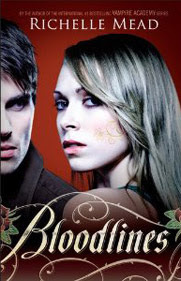 Rose Hathaway is a Dhampir, a bodyguard for her best friend Lissa, a Moroi Vampire Princess. They’ve been on the run, but now they’re being dragged back to St. Vladimir’s—the very place where they’re most in danger. . . .
*Description* Beatrice "Tris" Prior has reached the fateful age of sixteen, the stage at which teenagers in Veronica Roth's dystopian Chicago must select which of five factions to join for life. Each faction represents a virtue: Candor, Abnegation, Dauntless, Amity, and Erudite. To the surprise of herself and her selfless Abnegation family, she chooses Dauntless, the path of courage. Her choice exposes her to the demanding, violent initiation rites of this group, but it also threatens to expose a personal secret that could place in mortal danger. Veronica Roth's young adult Divergent trilogy launches with a captivating adventure about love and loyalty playing out under most extreme circumstances.